Asiawe- Iran mourns the passing of one of its most important political figures of the Revolution. Hashemi Rafsanjani, 82, died on Sunday. He was a momentous figure in the history of the Islamic Republic since the 1979 Revolution that overthrew Mohammad Reza Shah and the Pahlavi Dynasty. In his career, he played many roles: religious leader, military commander and astute politician. He served as minister, speaker of Iran’s Parliament and was elected president twice. Behind the scenes, his power and influence were boundless. For some time, he was rumoured to replace Supreme Leader Ali Khamenei, whom he had manoeuvred into position following Ayatollah Ruhollah Khomeini’s death in 1989. Rafsanjani was associated with the moderates and had given his support to President Hassan Rouhani. In a political environment that does not have strict political parties, political alliances are crucial to survival and Rafsanjani’s sudden death will have consequences for the fate of the moderates movement. After the Revolution, Iran was an isolated state, forced into a bloody war by its neighbour, Saddam Hussein. The United States embassy hostage crisis was ongoing and had ended one of the most important diplomatic relationships in the region. Thus, Iran saw the importance of establishing contacts and relations with Asian nations, and the Islamic world. And, Rafsanjani was instrumental boosting diplomatic relations with Malaysia. He had a vision to establish Iran as an “Islamic Japan” and his relationship with the East helped to inspire this. To end its isolationism, the Islamic republic focused on building embassies in Southeast Asia, namely Malaysia, Thailand and Indonesia. Rafsanjani made his first visit to Kuala Lumpur in his capacity as speaker of the house in 1981 to meet then prime minister Tun Dr Mahathir Mohamad. The following year, the Iranian embassy was opened in Kuala Lumpur. The relationship was initially focused on trade although there were times when the Malaysian government had to warn Teheran over its involvement in spreading Islamic revolutionary ideas to the country. In the 1980s, Iran was stuck in a long drawn-out war with Iraq. Rafsanjani was elected president in 1989, a year after hostilities ended between the two nations, and he was focused on rebuilding Iran’s economy and international relations. 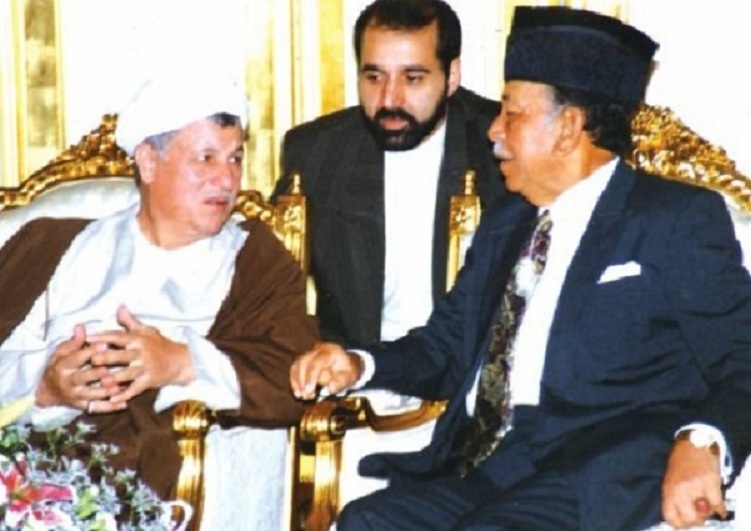 In October 1994, Rafsanjani arrived in Kuala Lumpur for an official visit, this time as president. A few months before, Dr Mahathir visited Teheran. This indicated the seriousness of the relationship between the leaders. Up to that point, Iran had signed agreements regarding trade and the exchange of commodities, mainly petroleum and manufactured products. Rafsanjani met with Dr Mahathir and then Yang di-Pertuan Agong Tuanku Jaafar ibni Almarhum Tuanku Abdul Rahman. During his three-day visit, Rafsanjani also met with business leaders to explore the expansion of commerce. As a country that was isolated and later under sanctions by the US and most Western nations, Iran had learnt to be self-sufficient and build strong economic ties outside of those restrictions. Dr Mahathir was quick to criticise the US Congress-passed sanctions, thus supporting Rafsanjani’s international reputation and economic standing. Rafsanjani’s visit helped to strengthen relations with Malaysia, which expanded trade and exchange of knowledge in public and private sectors. Following that, Petronas was awarded a contract in an oil field in southern Iran. Iranian troops were sent to Malaysia for training, while the flow of students from the republic to colleges and universities increased over the years. Malaysia enjoys a special position in Iran and among Iranians, thanks to the efforts of Rafsanjani since the 1980s. Ever since Rafsanjani’s first official visit over 10 years ago, every Iranian president has made an official visit to Iran: Mohammad Khatami in 2002, Mahmoud Ahmadinejad in 2006 and for the D8 Summit in 2008, and most recently Rouhani in October last year. By establishing diplomatic relations with Malaysia, Rafsanjani was able to move Iran away from isolation and gain a foothold in the region.